Great news for fans of S scale who are looking for small steam to run on an achievable layout: S scale brass designer/importer Dan Navarre at River Raisin Models has announced he will be bringing in Southern Pacific 2-6-0s in three different configurations. I’m a big fan of the Espee – and as I wrote on this blog very early on, I considered building an SP branchline layout in Proto:48 but decided my space was not quite big enough to handle O scale steam. But I have three Proto:48 SP Moguls – from Boo Rim, the same builder that is doing Dan’s S scale versions – and they’re delightful models. It’s not a big read – just 56 pages – but it brings to life the SP’s 24.4-mile Clovis Branch from Fresno to Friant, California. There’s a wealth of information on shippers, trains, operations, structures and more – including several well-drawn track diagrams and plenty of inspiring photographs in black and white and in colour. This branch just screams “California”: Serving packing houses, lumber yards, freight sheds and stock pens, the branch also serves an SP company ballast quarry and two wineries before end of track within sight of the massive Friant Dam. Scenically, the branch is a paradise for those who enjoy minimalism (or hate to build trees): Many photos in the book highlight wide open spaces and rolling hills, all covered in golden California grass. What’s missing for an achievable layout? Well, one would need SP cabooses and examples of SP boxcars, plus a string of ballast hoppers and some multi-dome tank cars for the wineries. But having an S scale model of a classic piece of branch line power from such a popular prototype is a wonderful development for those working in 1:64 (and Dan will import versions of this locomotive with a USRA coal tender which, while not at all accurate to the prototype, provides modellers of freelanced railroads set in the East with a plausible model). Thanks, Dan, for providing S scale enthusiasts with another locomotive that’s perfect for an Achievable Layout! River Raisin’s SP 2-6-0 would also look right at home on an S scale version of one of my favourite published track plans of all time – the HO scale ATSF San Jacinto layout created by Andy Sperandeo for the February, 1980 issue of Model Railroader magazine. It would be relatively straight-forward to resize this layout for 1:64, adding broader curves and longer switches if possible. 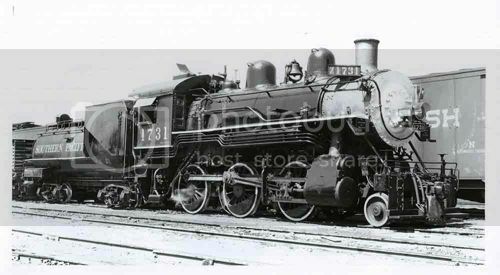 Creating an SP atmosphere would be as easy as replacing the ATSF stations with Espee standard designs, and changing the names of the towns: Andy’s industry selection is typical of California and could be used as-is. UPDATE (May 16, 2013): I’ve now drafted a quick layout design for the Clovis (Friant) Branch in S scale. Follow this link to the plan and notes. You sure do make it tough for a P:48 guy to stay true to his mistress! The last steam that I saw operating in regular service was SP back in the 1950s and it has always stuck with me. I enjoy reading all your posts. 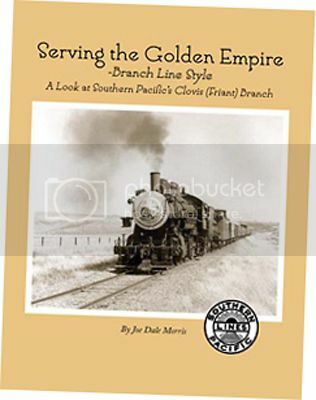 Another great book on the Espee, also by Joe Dale Morris, is his most recent on the Southern Pacific in Texas and Louisiana. Some great photographs, many of which were taken by his dad. An expensive book, but it is one of the finest railroad books I’ve seen, and am proud to own.